At 17 years old and having completed your CBT Compulsory Basic Training you can take your Restricted Access Tests which will allow you to ride a motorbike or scooter up to 125cc (brake horse power) with no L Plates. We can offer A1 Restricted Access Training and Tests within days of you first contacting us and regularly have candidates taking their test within a week of picking up the phone. If you live in Bolton, Chorley, Bury, Wigan, Salford or indeed anywhere within Greater Manchester or Lancashire areas please give us a call and pass your motorcycle test with Force Rider Training. Between completing your CBT test and taking your Restricted Access Tests you will also be required to pass the DSA Theory Test which consists of 50 questions and 14 video clips. Force Rider Training can advise you on the best way to approach and pass your Theory Test and help you gain that all important pass. 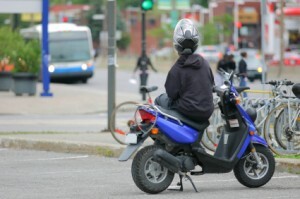 The Category A1 Motorcycle Licence is available for people aged 17 or above who only want to ride a scooter or motorbike with a maximum engine size of up to 125cc not exceeding 11KWH. Many people consider the A1 licence as a so called ‘permanent CBT’, with the added privilege of being able to use motorways, and carry pillion passenger’s. Following European Legislation changes in January 2013, the A1 Motorcycle Licence is the only motorbike licence available to those people between 17 and 18 years of age. You can choose take your A1 Motorcycle test on either a manual or an automatic motorbike. If you choose take your test on a manual motorcycle and pass, you can then ride either automatic scooters/mopeds or manual motorbikes. However if you decided to pass your test on an automatic, you will be limited to only automatic motorbikes and scooters only. Restricted Motorcycle Licence A2 ( also known as the Intermediate Access). Category A2. If you are aged between 19-24, and have successfully completed your CBT and motorcycle theory test or have a full category A1 licence , you may take the practical Mod1+2 tests on a machine of at least 395cc with a power output of between 33bhp-46.6 bhp, to gain the category A2 licence. After two years on this A2 restriction (or if you reach 24 yrs of age before the end of the 2 year restriction) you may then re-take both Mod1+2 tests for the category A licence, this must be on a machine of at least 595cc with a minimum power of 53.6 bhp, on passing these tests you may then ride any size machine with no power restrictions. I found Andy to be both friendly and very professional, I thoroughly enjoyed my training which gave me the confidence and the skills to pass both my Mod 1 and 2 first time. Thanks Andy for providing such excellent training. Andy’s training was very thorough and enjoyable. His approach to teaching was perfect for me as he was very professional and great for a laugh in the office. He made sure as much time as possible was spent on the bikes for maximum experience and teaching making the full days out a lot of fun. Passed both Mod1 and Mod2 first time thanks to Force Rider Training, Many thanks Andy. What can I say??. Force Rider training is brilliant! Thanks to Andy and Mike ( 2 retired Bike Cops, and really nice Guys. ) I passed my Mod 1 and Mod 2 first time. The training was first class, I honestly believe if I went with anyone else I would not have my full motorcycle license so soon. I chose Force Rider over any other riding school because, 1) I had a CBT with a different local training school and they were not good at all, my CBT didn’t seem very thorough it was over in 3 hours but I didnt know any difference at that time, I think they also talked down to me cause I was only 17yrs. 2) All my friends who have passed their full bike tests have gone with Force Rider and they’ve all passed first time. I recommend Force Rider to everyone that wants to pass the motorcycle test and have a laugh at the same time. So much fun and learning at the same time. Cant wait to get my restricted big bike then I’m working up to doing the advanced test with Force Rider. Thanks Andy and Mike! I thoroughly enjoyed my time with Andy and the team, the skills I have gained and the boost in confidence on the bike has made riding much more comfortable and enjoyable. A very professional service that I would fully recommend. Thanks Dan. I passed my cb test today with Andy. What a great guy. Can’t wait to carry on for my full licence, my theory’s booked I’ll be in touch. Thanks.. Absolutely legendary bunch of lads at Force. Honestly I couldn’t recommend them enough. The most interesting 4 1/2 days of training I’ve ever had. Did my CBT with Andy back in January and now returned to do my A2 license. A big thank you to Andy and Mike for the training, and for providing an amazing atmosphere, both whilst at Force and out on the bikes. The training is second to none, you Guys are quite simply the best. I shall be returning at least to do my full license in two years time and maybe for some advanced rider training after that. P.s just dont forget your documents when your going for your tests! I’ve just passed my mod 1 and mod 2 first time thanks to the effort of everyone at Force Rider. I’d firstly like to thank Phil for helping me with my CBT, Andy and Mike for getting me through my training and tests. I loved every minute of training at Force Rider and you have a laugh whilst doing it! The training was spot on and I’ve learnt more than simply just passing the riding test. I look forward to obtaining my full A licence when I’m 24 and completing some advanced riding. Thanks once again Force Rider, I’m off enjoying my new Suzi SV650 now. Did my CBT and A2 with them and loved it. I like how they actually teach you about the riding and really hammer it into your head in a very friendly and caring way. I started with my MOD 1 with an instructor in Chorley. After a few weeks, I had only been on a 600 bike once – wasn’t getting anywhere. Like Marc (#6) I’d still be on my 125. After just a few sessions with Mike & Andy at Force, I have passed my MOD 1 and passed the MOD 2 today. If you want quality professional training, and a really good laugh, and to pass any test on a motorbike, go with these guys. If I can do it, I would say anyone can! In my opinion, you would be mad to go anywhere else. Thanks Mike & Andy for all the training – I’m gonna miss the fun! Fantastic from start to finish. From the original telephone enquiry about getting on a bike at the age of 48 with no licence, to passing my Direct Access yesterday, all the lads at Force have been superb in their attitude and application. Their patience, knowledge, experience and enthusiasm for riding shines through, humour is used to great effect in the classroom at the start of the day but that quickly changes with the emphasis being put on safety and skills as soon as the bikes come out. All equipment, from clothing and safety equipment to the bikes themselves, is quality: clean and well maintained leaving you nothing to worry about except absorbing the expert advice and training being given to you. I have no hesitation whatsoever in recommending Force to anyone thinking of getting on a bike, you will not regret it. Massive thanks to Phil, Mike and Andy for putting up with me over the last month and getting me to the stage where I have now have a full bike licence, but most importantly to me, I feel safe now about going out and buying my first bike, and this is down to the training I have received from Force. Just passed my MOD1 and 2 first time because of their fantastic training! I couldn’t recommend them enough to anyone who is thinking about riding a motorcycle. Thank you to Mike and Andy for teaching me the professional way on how to ride a bike. Thanks to Force training, especially Andy and Martyn. Did my Cbt at another school in Manchester but went to Force on recommendation and I was certainly glad I did. On the first day I quickly realised that I hadnt be taught much on my Cbt but Martyn was very patient and went through everything at a pace so as I could take it in. Mod1 seems relatively easy on youtube but that doesnt give you the techniques to do it safely and properly. Mod2 is the road riding test and I really liked how Force teach you to ride safely not just to pass the test. Both tests passed at first attempt. Thanks Guys, see you soon for some advanced training.